Exuberant Color : First day of spring? This is what we saw yesterday morning. 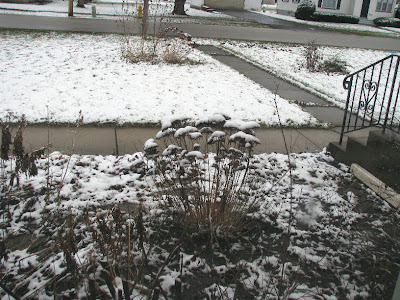 It is pretty typical for the first day of spring in northern IL. It snowed all day but melted on the roads. I have spring inside though. 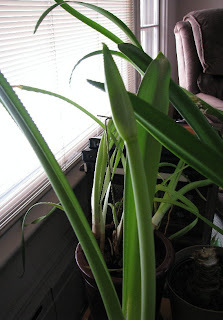 I have all of the old amaryllis bulbs that I have kept for the last 5 years and 2 of them are just sending up bud stalks now. They are pretty spindly so I'm not expecting too much. The big pot has 4 bulbs planted in it. This is the final layout and I will start sewing blocks today. I changed about 5 triangles and I'm happy with it now. It has 308 different Kaffe fabrics in it. There are only a little over 100 different patterns in his line so some are repeated in more than one colorway. I spent a lot of hours yesterday putting away the Kaffe fabrics (in order by style number). I also added more swatches to the Kaffe file cards from the scraps left over from cutting. I feel pretty organized now. That triangle quilt is amazing. How is your dad doing in the nursing home? I don't think that the snow will last too long. It has been warm and sunny up here. The quilt looks great with all the Kaffes. That white stuff is not appreciated on the first day of spring! Happy sewing on that grand quilt. I would say you are ultra organized! And the final layout of your quilt is really beautiful. Love it! I live in MN and am so thankful that your yard is not what my yard looks like. It might happen this next week thou. You do such beautiful work. I can't imagine how great these quilts look like in real life. I have to start collecting my Kaffe even if it means one charm pack at a time. that's a great organizational idea, wanda...i may have to use that. can you please come over and get me organized too?!!!! We saw some snowflakes floating through the air yesterday but nothing stayed anywhere thankfully. Wow -- that is incredible organization. I figure I'm doing well if I have like fabrics together. But it does mean, I think, that I waste a lot of time finding what I want. great quilt! snow - yes I remember from living in the snow in the spring - and here in Arkansas it is rarer to have snow on first day of spring and in the northern part of the state they had the snow storm yesterday too, I have not talked to my mom today to find out how much-it will warm up fast though and will all be gone soon. I feel "pretty happy" about your quilt also. Love it ! Wow Wanda - 308 Kaffe Fabrics- can you feel me drooling through my computer- that is quite the beautiful collection. It was his fabrics that I was looking at yesterday but I resisted buying. I decided I need to use some of the beautiful fabrics in my own stash. They are not as organized as yours but I do have my own crazy system of organization - just not catalogued. You will just have to keep creating Kaffe Quilts for me to admire- which I will do without hesitation. VBG Your work is always beautiful..
We had a skiff of snow on Thursday but it has been pretty nice this weekend and the snow continues to melt. Hope the Amaryllis blooms for you- they are so gorgeous when they blossom. oh my God!, But don?t worry, also in italy we have a bad time!. It's raining at it will be raining for all the week. but also in my quilt shop I have make my own spring. My best compliments for your latest quilt. It's very important for me in italy study your work. In next time i will experimenti the Disappered nin patch with the batik fabrics that I have buy. sorry for my bad english. It's possibile it will be better .Bye Francesca from italy (tessilesa.blogspot.com) Come to me ! 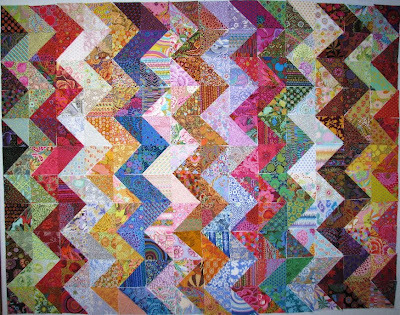 I just love this zigzag quilt, Wanda! I love your final layout!!! Very pretty! We're supposed to get snow here in SE TN tomorrow! Oh well! Oh my - 308 different Kaffe fabrics???? You are truly an artist Wanda! Looks like we have twin yards, only I'm a couple hundred miles away. Did yours melt today, too? OK, I dub thee Organization Queen. I'll never be that organized, but your cards did remind me ... I'm supposed to bring 2-inch strips of "brights" to my quilt class tomorrow. I just wasn't sure what to bring. Well, duh! I hadn't even looked at my Kaffes and they certainly are bright. Thanks. Wanda, you are so wonderfully organized. You make me think of my Mother, who also has this trait. I'm afraid I have not followed her footsteps but wish that I had. As for the amaryllis, I'm sure that your will be beautiful again. Mine--I'm not sure that it will bloom. I'm keeping an eye on it. 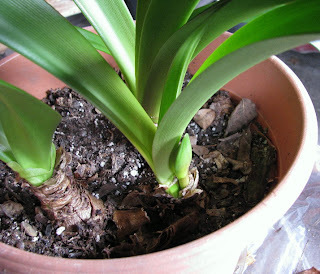 also, about those amaryllis bulbs... do you summer them in the ground outdoors? My son does that with his and they get HUGE being outdoors. Then they bloom robustly indoors. 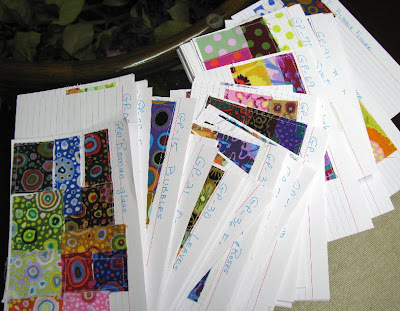 What a great idea to index the fabric on cards. How do you do it and how do you use it? In other words, how does it help you? (Not feeling very articulate with these questions LOL)! !